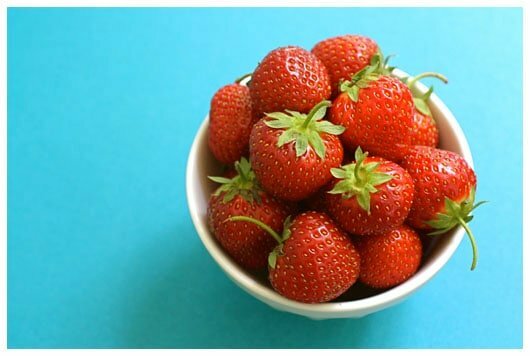 Have you ever tasted a freshly picked strawberry, warm from the morning sun? There is absolutely nothing like it. And if you haven’t experienced strawberry picking, I hope you unfold that Bucket List in your pocket and add this simple summer joy. My first experience with freshly picked strawberries was from my aunt Patsy’s garden. As a kid, I marveled at the extraordinary flavor and texture of those little crimson gems. And now, as an adult, I make a point to get our girls to the local strawberry u-pick each summer. Homegrown berries are nothing like you’ll find at the grocery store. Ruby red all the way through, with not a spot of white in the center, they are juicy and fragrant, sweet and tangy. It’s like sweet, sweet summer melting in your mouth. 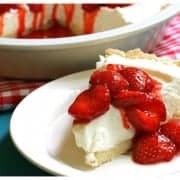 This Strawberry Pie is a favorite at our house, straight out of Patsy’s recipe box. It has a pressed in shortbread cookie-like crust that my whole family adores, filled with a whippy mixture of freshly whipped cream and cream cheese that I can’t help but snitch as I’m making it. Then it’s topped off with a strawberry sauce of that sweet, sweet summer. Ohhhhh…I do hope you enjoy this. Prepare the crust. Preheat oven to 325°. Combine the flour, sugar, and salt in a medium bowl. With a pastry blender, cut in the butter until crumbly. Then quickly mix with hands until it forms a dough. Don’t worry if it seems a bit dry. Press dough evenly onto the bottom and up the sides of a 9″ pie pan. Aim for a uniform thickness on all surfaces and don’t press the dough in too hard. Bake the crust for 20 to 25 minutes, or until it is just lightly browned. Cool completely. Prepare the whippy cream cheese layer. First whip your heavy cream until stiff and then set it in the refrigerator. Then, in a separate bowl, cream together the cream cheese and 1 cup powdered sugar until smooth and fluffy, about 1 or 2 minutes. Blend in the vanilla. Fold the whipped cream into the cream cheese mixture until thoroughly combined. This is some awesome stuff. Try to not eat it all right then and there! 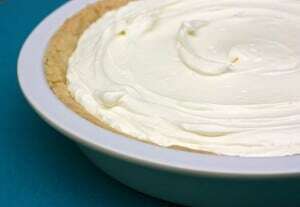 Then scrape the whippy cream cheese mixture into the cooled pie shell, smooth it out, and refrigerate. Prepare the strawberry topping. Combine the sliced strawberries and 1/2 cup powdered sugar. Let stand for 30 minutes. Drain the strawberries, saving the juice. If necessary, add enough water to make 1/3 cup of berry liquid. Combine the cornstarch, drained strawberry juice, and red food coloring in a small saucepan over medium heat. Cook, stirring constantly, until thick and clear. If the cornstarch forms lumps, simply smoosh out the lumps with a spatula. Once thickened, immediately remove from the heat and cool completely. Then combine the thickened juice with the drained strawberries and fold gently to combine. Now you can do one of three things to assemble your pie. 1.) 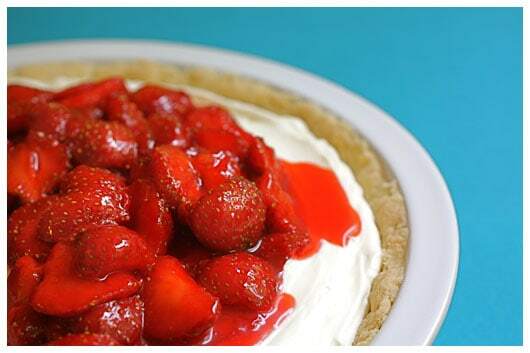 If you plan to eat the pie within a few hours, go ahead and spread the strawberry topping onto the top of the pie. Try to stay an inch away from the crust, as the juice can soak into the crust and make it soggy. Not a big deal, though, if you plan to eat the whole pie rather soon. Refrigerate for at least an hour before serving. 2.) A second thing you can do is just put your strawberry topping in a bowl and refrigerate it until you’re ready to eat it. When ready to enjoy, spread the strawberry topping on the pie. Then slice and serve. 3.) Or, if you predict not finishing off the pie that first day, just completely leave the strawberries separate. 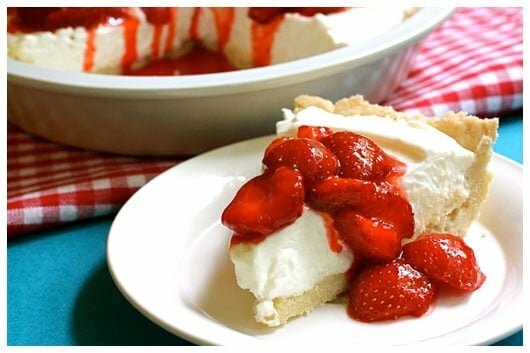 Cut your pie servings without the strawberry topping spread on top (like the bare pie above). Then spoon some of the strawberry topping onto each individual piece. The pie crust will stay crisp and last much longer this way. I’m linking up with the following. Please check them out!